For several years I’ve had a dream that St. Martin was covered in signs explaining everything that makes the island unique and special. The island does have a few, but they’re mostly found at particularly old ruins and they mostly explain political and economic history from the colonial era. The actions of European-appointed leaders or the rise and fall of the sugar and salt industries are part of history, but so many other things are left unexplored. Imagine 1,000 signs on the island, revealing 1,000 stories. I would love to read about Simpson Bay during the hundred years when the sea cut it off from the rest of the Dutch side of the island. I would love to learn about the artists and craftsmen who carved the delicate gingerbreading that can still be seen local houses, or produced the decorative cinderblocks that frame so many porches. French and English meet on a street sign. As it turns out, there are hundreds of signs on St. Martin. They don’t actually explain all these things, but they offer plenty of clues. Street signs, where they still exist after Irma, may tell a broader story than the signs designed to educate. One that caught my eye many years ago was Rue des Gun Dove in French Quarter. I didn’t know of any bird known as the Gun Dove. It seemed possible that it referred to a dove that people hunted, but to my knowledge local hunters preferred hunting the larger pigeons. 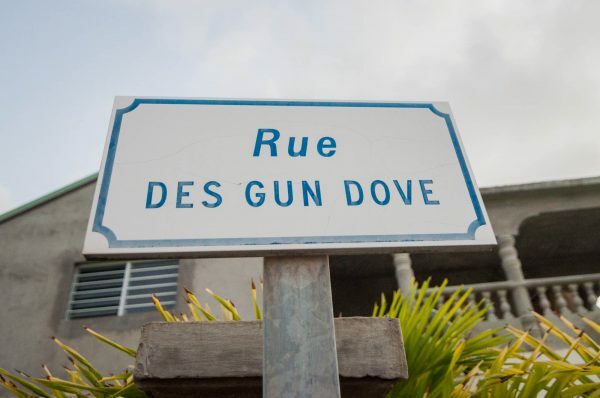 I looked it up on Google Maps today and it was shown as Rue des Ground Dove. The Ground Dove is a bird found here. Is “Gun Dove” a local name for it, or possibly a miscommunication when printing the sign? Nearby, a sign marked Rue Rond the Pond. This mix of French and English is a reflection of St. Martin. The road itself runs around part of a pond, or ‘round the pond. The French rond, translates more directly as round, as in circular. A more direct translation of around would be autour, but that is certainly not as lyrical as Rond the Pond. 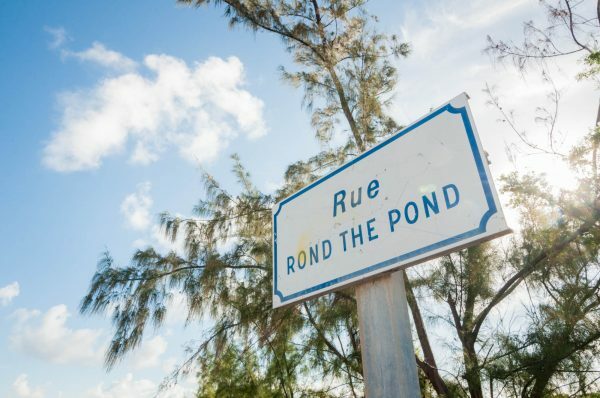 Google shows it as Rue de Round de Pond, which is even less poetic. From Rue Lady Fish in Sandy Ground to Manjack Drive in Cole Bay, street names give countless clues to the history and culture of the island. There are streets named after people, plants, animals and features of the landscape. What are your favorite street names, and do you know the story behind them? Write in to The Daily Herald, or to info@lesfruitsdemer.com and tell us about them!